American Horror Story is chuck full of strong characters with sink your teeth into back stories. Each one brings its own little horrors to the show - even the guest characters with one or two show arcs have fleshed out back stories which helps make the show so interesting. Is thought to be a Nazi. Twins or the same boy with multiple personality disorder? She is thought to be dense. Runs Briarcliff Manor Sanitarium with a firm hand - and some cane. He killed his wife and claims she was abducted. A reporter, she ends up in one of the asylum's beds. Honeymooner in the present time. She is said to be Sister Jude's antagonist. Is a psychiatrist at Briarcliff Manor Sanitarium. Sam Goodman is a Nazi hunter and a Holocaust survivor. 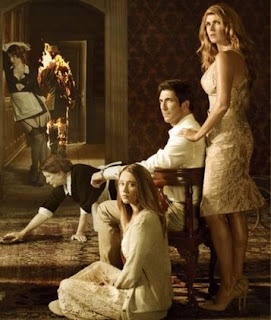 The characters from season one are all interwoven as they all reside in the Murder House. Some are living, some are dead, and some become dead after being in the house. She worried about being split in half. Medium, Ryan Murphy said in an interview that we should consider her legit. Chad loves the house and goes to great efforts to restore it. Is terrified of Urban Legends and can get a date because he is afraid to look in the bathroom mirror. Was pregnant when she was killed. Ben moved his entire family to LA to create a new start. She was very interested in the house when she found out about previous owners murder/suicide. She was trying to get pregnant again, but doesn't like to take drugs, she prefers to let nature take its course. Friend of Constance, a medium. As punishment, her mother locks her in a room full of mirrors. Constance can see all of the dead people in the house. He doesn't remember being dead, or acts like he doesn't know it. Luke is an agent for a private security company. Real Estate agent who sold the house to the Harmon family. She is a good maid and becomes very fearful when Vivien wants to get rid of her because she can no longer afford her. Charles built the house back in 1922 for his wife. Set up for women to obtain illegal abortions through her husband in order to pay the bills. He was the reason for the first home invasion. He is killed by a patient's boyfriend and cut up into little pieces because the doctor performed an abortion on his girlfriend. They have the distinguished honor of being American Horror Story's first deaths.